A particularly attractive bumblebee, with bright yellow bands on the thorax and a rich orange-red tail covering around two-thirds of the abdomen. A localised and declining species, found almost exclusively on moorland in association with stands of Bilberry. No records from the south-east. 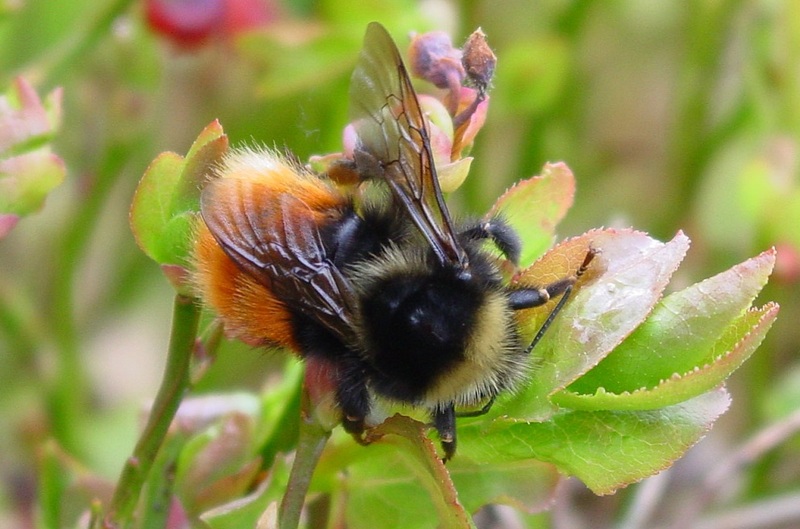 Bilberry bumblebees. Photo credit: Ian Fozzard (left), Keith Broomfield (right). The Early bumblebee (Bombus pratorum), Scottish Isles orange-tailed form of the Heath bumblebee (Bombus jonellus), and males of the Red-tailed bumblebee (Bombus lapidarius) have the same red tail and yellow-black-yellow thorax of the Bilberry bumblebee, but only this species has the red tail extending over more than 50% of the abdomen.